"There cannot be good living where there is no good drinking." - Benjamin Franklin. 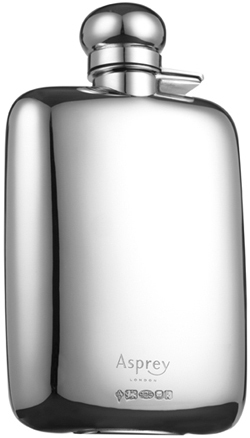 A HIP FLASK is a thin flask for holding a distilled beverage; its size and shape are suited to a trouser pocket. Hip flasks were traditionally made of pewter, silver, or even glass, though most modern flasks are made from stainless steel. Some come with small cups to make sharing easier, although generally liquid is drunk directly from the flask. They are usually contoured to match the curve of the wearer's hip or thigh, for comfort and discretion. 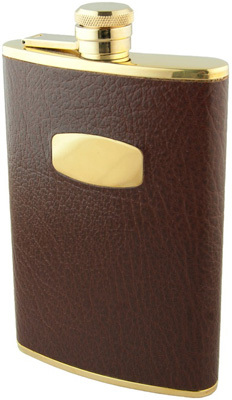 The hip flask is popular as commemorative item, often being engraved. The hip flask began to appear in the form recognised today in the 18th century, initially used by members of the gentry. However, less compact versions had been in production for several centuries. Notably, in the Middle Ages, there are several accounts of gutted fruit being used to store liquor. During the 18th century, women boarding docked British warships would smuggle gin into the ship via makeshift flasks, created from pig's bladders and hidden inside their petticoats. Following the act of prohibition in 1920s America, the state of Indiana banned the sale of cocktail shakers and hip flasks. 10 Amazing Flasks - "The Ultimate Guide to Flasks." 10 best hip flasks - The Independent. The 25 Coolest Flasks of All Time - HiConsumption. 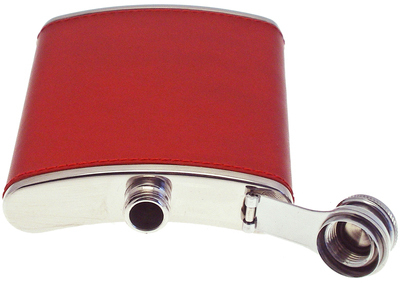 2-in-1 Cigar Holder and Flask (Engravable) - "It's a flask, no it's a cigar holder..."
ASPINAL OF LONDON - leather hip flasks with FREE engraving. Asprey - hipflask in Asprey hallmarked sterling silver. Engraved Flasks - at Things Remembered. Geo F. Trumper - 6oz & 8oz flasks. HARRISON & SIMMONDS - since 1928. "Quality Hip Flasks in English Pewter, Sterling Silver & Stainless Steel." HermÈs - since 1837. A flask wrapped in green Hermès leather. Circa 1930’s. 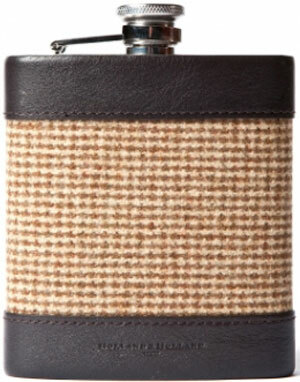 HOLLAND & HOLLAND - signature tweed hip flask. I. FRANKS - antique silver hip flasks. Jimmie William - Stanley hip flask. KENNETH COLE - holds 6 oz. 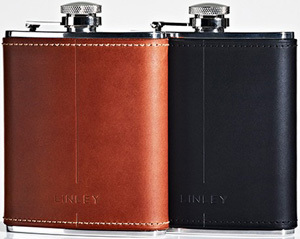 LINLEY- stainless steel 6oz. 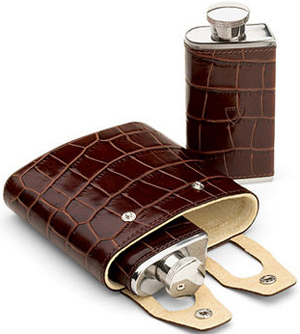 hip Flasks in leather casing. 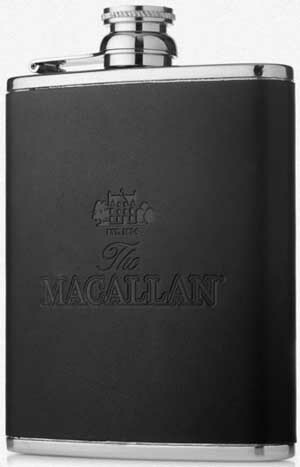 Macallan - "pewter hip flask wrapped in leather for a dram of The Macallan whenever it takes your fancy." memobottle - "Slim premium reusuable water bottles." A slimline premium reusable bottle that fits in your bag. Simplify your lifestyle with our slim A5 & A6 water bottles. MULHOLLAND - six ounce captive top flask & ten ounce sportman's flask. PICKETT - since 1988. Hip Flasks & Cup Sets. PURDEY - since 1814. All models. Roderick Charles - 90 Jermyn St., London, England. Triple Leather Bar Set: Three Seperate Flasks. 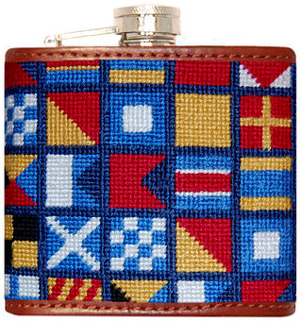 SMATHERS & BRANSON - needlepoint flasks. Stanley Flasks - since 1913. All models. 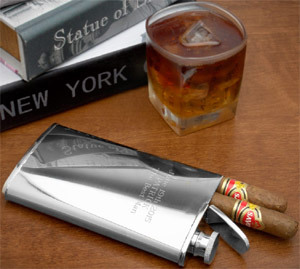 SWIG - "Luxury Stainless Steel Hip Flask Brand." Tiffany & Co. - since 1837. Century sterling silver flask. TRUEFITT & HILL - since 1805. Made in England. 4oz & 8oz hip flasks. WILLIAM & SON - since 2000. Silver hip flasks. 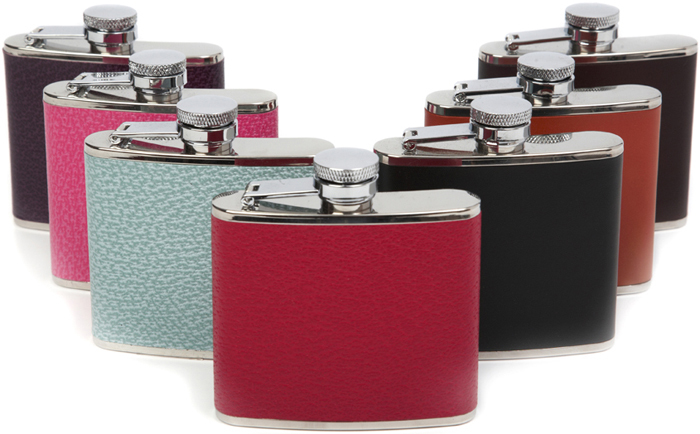 X Flasks - "Luxury British Hip Flasks from London." Personalise your flask with engraving.